Modern Mithraic studies begin with the two volume publication by Franz Cumont of Textes et monuments figurés relatifs aux Mystères de Mithra : pub. avec une introduction critique, in 1894 and 1896. This is abbreviated on this site as TMMM, and as MM in Vermaseren's CIMRM. For the next 60 years it formed the basis for all study of Mithras-related materials.1 It was largely replaced by the CIMRM, which in turn is now 60 years old itself and in need of replacement. Vol. 1 is an introduction, now obsolete. Vol. 2 is a collection of primary data. It is online at Archive.org here, and still of value, especially for the literary texts which do not appear in the CIMRM.. The structure of vol. 2 is a little unusual. It begins with a section giving the various literary texts that refer to Mithras, in various languages. It is then followed by a section on the monuments. But the inscriptions on these monuments are then placed into a third section. Abbreviated versions of volume 1 were translated into several languages. 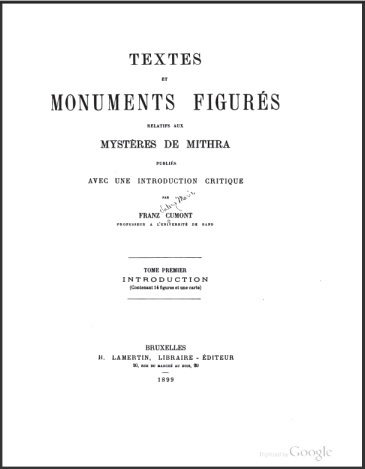 In the 1913 edition of Les mysteres de Mithra, Cumont added an appendix with a bibliography of publications since 1900, and also of additional texts and monuments. 1 A. D. Nock, Review of the CIMRM, Gnomon, 30. Bd., H. 4 (1958), pp. 291-295, on JSTOR. p.291: "For sixty years all study of Mithraism has been based on Cumont's masterpiece; ..."